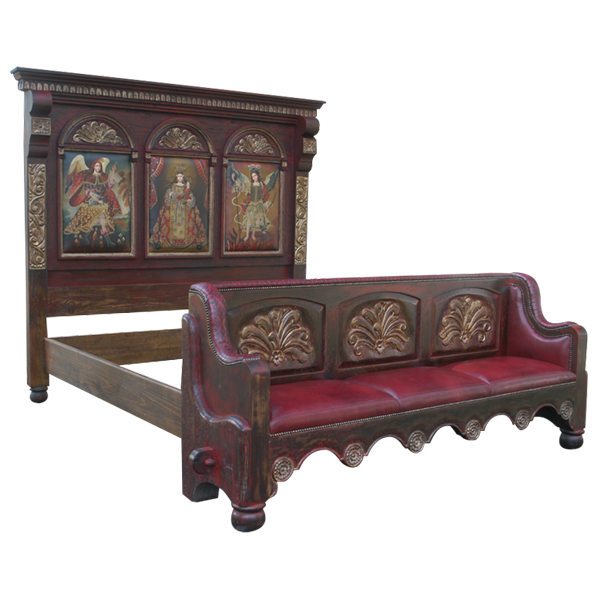 This handcrafted, Spanish colonial style bed combines bold, Baroque style ornamentation with exquisite, contrasting, decorative elements to create a marvelous piece of functional art. The headboard has a straight, top molding, and below the top molding are small, gold finished, hand carved, geometric details. The front of the headboard has three, gold accented, geometric shaped panels. 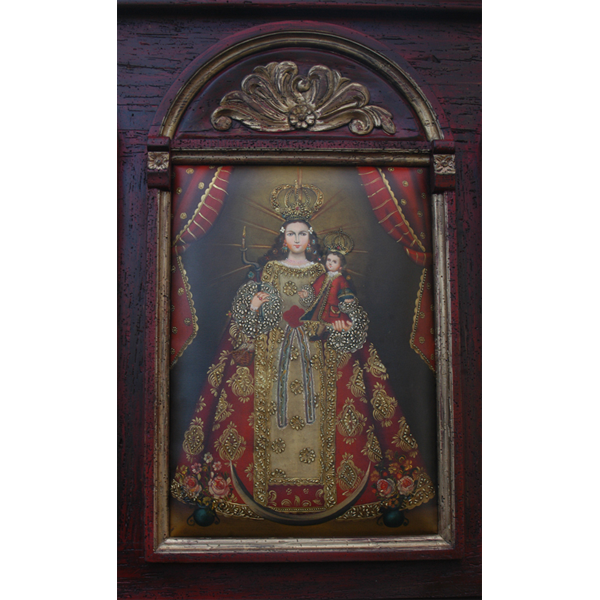 Each panel is enhanced with an original, Peruvian, religious oil painting, and above each painting are arched, hand carved, gold finished, scroll designs. 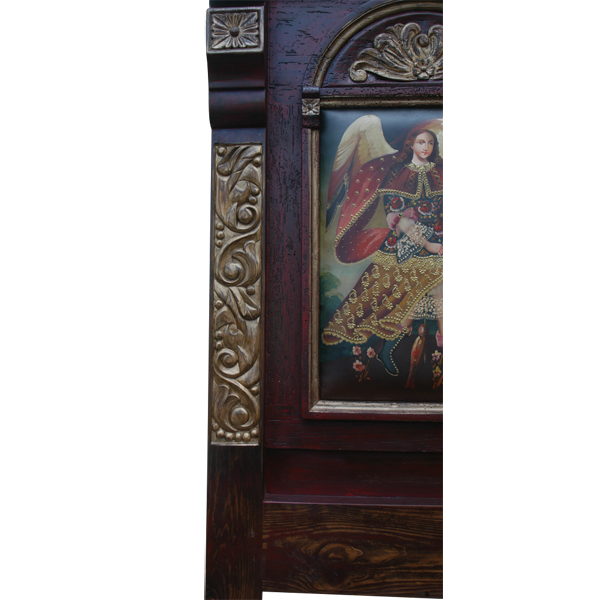 The bed is framed with solid wood uprights, and each upright has beautiful, hand carved, floral details on its face. The footboard is built into a bench, and the bench has a rectangular, solid wood, seat back, and the top of the seat back is padded and upholstered with red, patterned, full grain leather. The red, patterned upholstery is repeated on the sides of the seatback, and the upholstery flows downward and covers the top of the armrests. 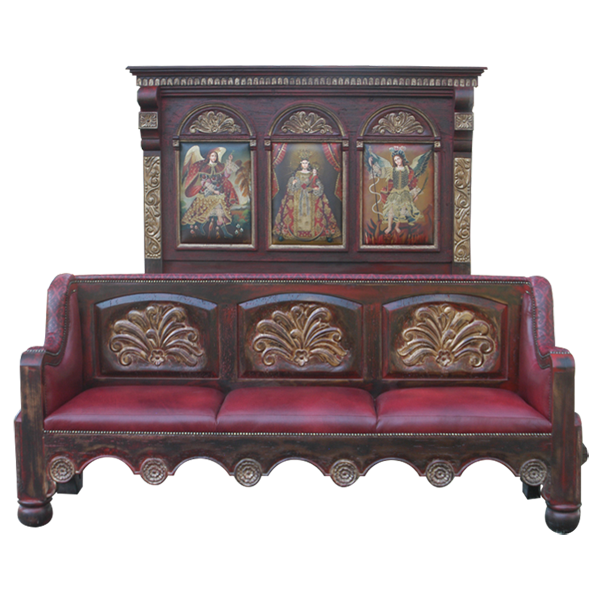 The seat back is adorned with three, arched panels, and each panel has elegant, hand carved, floral designs. 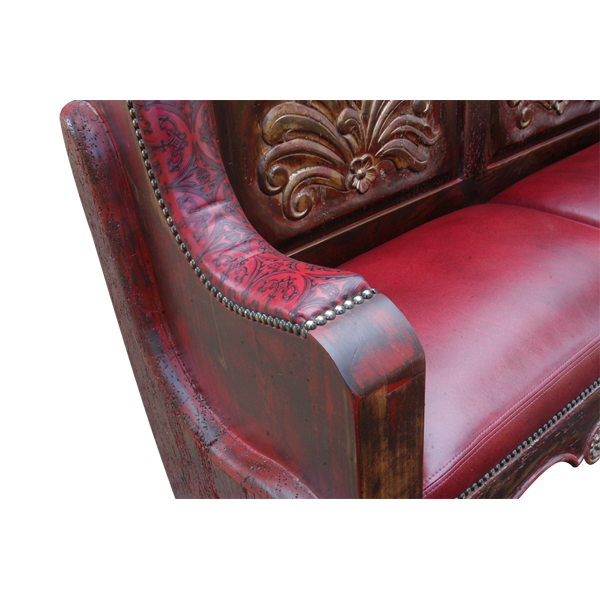 The seat back is finished with an antique, red stain, and the floral designs within the panels have a distressed, gold stain. The wide seat is divided into three sections, and each section is upholstered with red, patterned, full grain leather, and the same red upholstery covers the inside portion of the armrests. All of the upholstery is precision hand tacked to the frame with brilliant, gilt nails. The lower front of the bench has a curved, Spanish colonial style apron, and the apron is accented with gold stained, circular, floral details. The front of the bench rest on hand turned, bun style feet, and the bed has a solid wood, structural base. It is 100% customizable. This bed can be combined with our Zoila-Elisa armoire (arm22), our Zoila dressers (dress15, 26), and with our Zoila end tables (etbl39, 40).